Some of the empty bowls from the 2019 Empty Bowls fundraiser are displayed on Saturday, March 30. 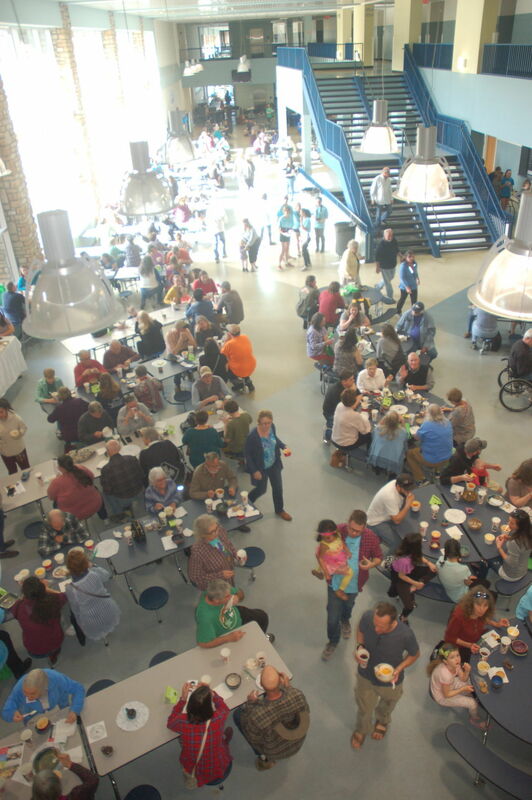 Hundreds of hungry patrons enjoy their soup at the 2019 Empty Bowls fundraiser at Watauga High School on Saturday, March 30. Empty Bowls volunteer Sylvia Rippy fills up a bowl on Saturday, March 30. Dozens of items, such as these birdhouses, were available for auction during the 2019 Empty Bowls fundraiser on Saturday, March 30, at Watauga High School. Susan McCracken, Barb Krause and Elizabeth Young pose for a photo during the 2019 Empty Bowls fundraiser at Watauga High School on Saturday, March 30. BOONE — The 18th annual Empty Bowls fundraiser drew in excess of 500 people to sample soups from all different types of restaurants on Saturday, March 30, at Watauga High School. Along with a silent auction, the dinner has raised $11,679.73 and counting, according to Hunger and Health Coalition Executive Director Elizabeth Young, who believes this year’s event to be the highest in attendance and second highest in fundraising in the event’s history. All proceeds from Empty Bowls went to the Hunger and Health Coalition — a Boone-based organization that aims to eradicate hunger in the High Country by providing a food pantry, increasing awareness of food insecurity in the area and offering many other services. The donation covered a handmade ceramic bowl and a soup meal. Also available were handmade desserts and drinks, with stations manned by volunteers. During the event, patrons were treated to a selection by the Watauga High School symphony orchestra, as well as a musical number by WHS students taking part in the performance of “Newsies” from April 4-6.